This wildlife tour covers two spectacular parks of central India Bandhavgarh & Kanha, both unique & diverse. 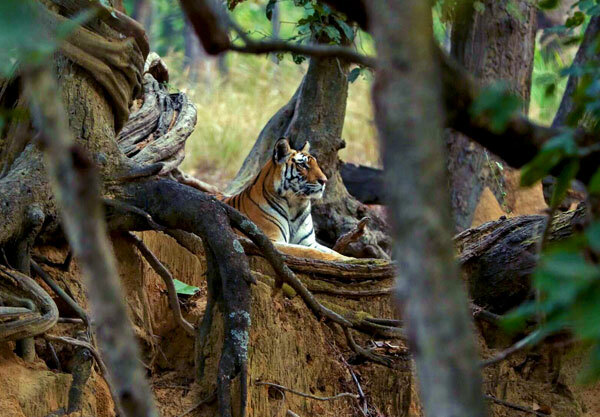 Bandhavgarh is the stronghold for Tigers and probably the best place in the world to sight one. Kanha is famous for its lush green grasslands and towering Sal forest. Kanha is popular for Tigers, bird watching & is the last home of the only surviving population of Hard Ground Barasingha (Swamp Deer). Bandhavgarh was established in 1968 as a National Park, and is spread over an area of 448 sq. kms. This national park was declared as a tiger reserve under Project Tiger in the year 1993. It is predominantly covered with vegetation like SAL, SALI, DHOBIN and has vast stretches of grasslands spread over 32 hills, the region though smaller than other wildlife parks has one of the highest density of tigers in the world. Kanha Tiger Reserve's spectacular Sal and Bamboo forest, rolling grasslands and meandering streams stretch over 1945 sq. km. in the heart of central highlands. This is the original Kipling country so fondly written about in the Jungle Book. The park is the only home to the rare Hard Ground Barasingha found in its large grasslands. Kanha is also home to Tiger, Leopard, Sloth Bear, Deer, Ungulates, Lesser Cats and close to 300 bird species. Day 01: Bandhavgarh National Park Arrive Bandhavgarh Tiger Reserve for lunch. Evening at leisure followed by dinner at Kings Lodge. Day 02: Bandhavgarh National Park Morning and evening jeep safaris in Bandhavgarh Tiger Reserve. Day 03: Bandhavgarh National Park Morning and evening jeep safaris in Bandhavgarh Tiger Reserve. Day 04: Bandhavgarh – Kanha Post breakfast drive 5 hours to Kanha Tiger Reserve. Evening nature walk and village visit. Day 05: Kanha National Park Morning and evening jeep safaris in Kanha Tiger Reserve. Day 06: Kanha National Park Morning and evening jeep safaris in Kanha Tiger Reserve. Day 07: Kanha National Park Post breakfast transfer for further connections. Tour cost: USD 1320 per person on twin sharing. Get 20% off for travel between 6th January 2019 to 21st January 2019. Get 20% off for travel between 1st May 2019 to 30th June 2019. Twin sharing accommodation in lodges as specified in program. All meals (6 breakfast, 6 lunch and 6 dinner) and tea/coffee service. Nature walks as per program. Four shared safari in Bandhavgarh with entry fees, jeep charges and guide charges included. Four shared safari in Kanha with entry fees, jeep charges and guide charges included. Road transfers by air conditioned Toyota Innova or similar between Bandhavgarh and Kanha. Any airfare, rail travel and transfers from the nearest airport or railway station and back. Anything that is not included in the above inclusion list. Above rates valid till 30th June 2019. Bandhavgarh a stronghold for Tigers since time immemorial offering good probability to site one. Kanha also popular for Tigers & the last stronghold of Hard Ground Barasingha (Swamp Deer). Known for its towering Sal forest & teeming grasslands. Services of an experienced English speaking naturalist. The trip can be modified to suit your preferences & arrival/departure time.